Still early to speak about crucial encounters but tomorrow's derby between Valletta and Floriana is definitely a championship/relegation pool six-pointer rolled into one. That may sound rather confusing but the two rivals' positions in the middle-bottom part of the table means a victory would inch either of them closer to a place among the top six whereas a defeat would leave them standing on the relegation pool trapdoor. Floriana's situation is slightly better than that of the Citizens as the Greens have a two-point lead on Valletta before tomorrow's showdown at the National Stadium (4 p.m.). Valletta will be hoping for a turnaround in fortunes after a series of disappointing results endangered their prospects of a top six place, never mind access to European competitions which had been a foregone conclusion for so many years. Atanas Marinov, the Valletta coach, has issued a rallying call to his players. "This derby is a very important game for us," Marinov told The Sunday Times. "It's high time the players realise how important this game is for Valletta. A significant number of league games have already been played but we have yet to find our rhythm. "Before the game against Hamrun, I warned the players that we were in for a tough test and I was proven right. If somebody is still under the illusion that teams will roll over when they face Valletta, they are wrong. "I believe the team has suffered from this misconception. We have had our fair share of setbacks and that has only added to the pressure on the players," the Bulgarian remarked. Marinov's desire to boost his team's ailing self-belief has seen him calling in a sports psychologist to have a talk with the players in mid-week. The former Hamrun and Birkirkara coach expects the players' commitment during training this week to be reproduced on the field of play tomorrow. "Training has been very good so far, I cannot lament," Marinov said. "If only my players manage to perform during matches as they normally do during practice, I would be a very happy man. This game is the right opportunity for the players to give themselves and the fans a much-craved tonic," Marinov said. Defender Kurt Farrugia is out of the reckoning after a red card against the Spartans earned him a one-match suspension. He is the only absentee for Valletta as the other players are all available for selection. Although Marinov is typically optimistic, he is the first to admit that Floriana will make life difficult for his team. "Floriana are better than last year. They have so many talented young players in their ranks and on their day, they can beat anyone in the Premier League," Marinov said. Valletta's unconvincing results so far may have dented their reputation but they have not diminished Ziya Yildiz's respect for them. The Floriana coach is still wary of Valletta's never-say-die attitude even if that has been in short supply this season. "Valletta have not been impressive so far but you can never underestimate them. Their pride and tradition make them difficult opponents whatever the circumstances," Yildiz said. Like Marinov, Yildiz regards the derby as a significant match. "It's an important game for both sides. I'm sure that Marinov and the Valletta people are thinking the same about the match. I guess, it is more crucial for them rather than us. "Provided that we are two points ahead of them, a win for us would increase the gap on Valletta and Marsaxlokk to five points. That would be a significant step towards a place in the top six," Yildiz said. Injuries deprive Yildiz of two key players though, namely, Congolese defender Riad-Mynel Gango-Rtsa and striker Jean Pierre Mifsud Triganza. Jonathan Holland resumed training after returning from a trip abroad and skipper Claude Mattocks has shaken off the effects of a previous injury. First round result - Floriana vs Valletta 1-1. Pietà H. vs Hamrun S. (today at 12.45 p.m., Hibs Ground). A high-octane match is expected this afternoon when neighbouring rivals Pietà Hotspurs and Hamrun Spartans lock horns. Pietà will be hellbent on atoning for their 5-1 trouncing to Birkirkara to move back into second place, in the process enhancing their chances of securing a top-six berth with some weeks in advance. With only two points from 10 matches, Hamrun seem to have little chance of forcing their way back into the upper echelons but they ought to derive strength from their 2-2 draw with Valletta in their last outing. Ray 'Zazu' Farrugia, the Pietà coach, must cope without goalkeeper Saviour Darmanin who has a wrist injury. Cleaven Frendo is expected to be certified fit to play after he picked up a slight ankle injury while training with the national squad. Cameroon striker Fransis Omam is back in the frame after completing his rehabilitation from a hamstring problem. Gencho Dobrev, the Spartans' coach, is handicapped by the absence of suspended striker Gaetan Spiteri, scorer of a brace in the 2-2 draw with Valletta. First round result - Pietà H. vs Hamrun S. 3-0. Sliema W. vs Balzan Y. (today at 2.45 p.m., Hibs Ground). Hibernians' unexpected defeat to Balzan Youths must have set the alarm bells ringing at Sliema. The champions meet the resurgent Balzan today knowing a half-hearted approach could derail their bid to make up ground on leaders Birkirkara. Carlo Mamo is ruled out by suspension but otherwise, coach Edward Aquilina can bank on a full complement. Daniel Bogdanovic is no longer available for the Blues after he opted to cut short his stay there and join Marsaxlokk. He will only become eligible to turn out for Marsaxlokk next month. Jaroslav Marx, Balzan captain, has received a one-match suspension and is out of today's clash. The selection problems for Jimmy Briffa, the Balzan coach, do not stop there though as David Agius and Michael Martin are also struggling with injuries. Briffa is also angered by the injuries suffered by Shaun Tellus and Alex Muscat during training with the Malta U-21 team on Monday. The Balzan mentor questioned the MFA U-21 coaches' decision to instruct Tellus and Muscat to take full part in Monday's training session when they had been involved in a league match the day before. First round result - Sliema vs Balzan 3-1. Birkirkara vs Msida SJ (tomorrow at 2 p.m., National Stadium). Premier League leaders Birkirkara are favourites to extend their unbeaten sequence against Msida St Joseph. Stephen Azzopardi may have to make a few changes to his starting line-up as skipper Chucks Nwoko and Nigerian striker Haruna Doda are both rated doubtful. Michael Galea, Birkirkara's top scorer with 10 goals, will definitely miss tomorrow's clash as he is recovering from injury. Joe Grech, the Msida St Joseph mentor, must find a replacement for Italian defender Manuel Boni who must serve a one-match suspension. First round result - Birkirkara vs Msida 7-1. Gilbert Agius will play his 250th Premier League match for Valletta tomorrow. 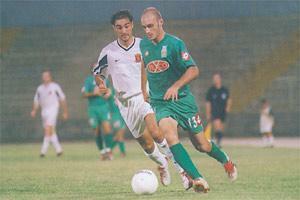 Agius started his Premier League career on September 2, 1990, coming on as a substitute for Alex Busuttil in the match against Sliema Wanderers (2-3). So far, Agius scored 127 goals in the league.